This has been an exciting year for progress at AIS. It seems like we’re starting to be more open-minded to trying to new things. It’s been fun! First semester the ES did a series of 3 Edcamps during weekly staff meetings. Inspired by the feedback, our MS/HS professional development planning team decided to try out the Edcamp model during our half-day PD. Although I’m not part officially part of the team, I helped on the back end. Kudos to Christina, the rest of the team and the entire AIS staff for being risk-takers! To see more details from a different perspective, check out Christina’s post. People who proposed topics were asked if they wanted to facilitate (in the Gform). If they didn’t, the PD planning team asked other staff members to facilitate the proposed topic. Christina held an Edcamp facilitator ‘orientation’ where she shared information & answered questions. All staff were asked to sign-up for topics. The facilitators were kept ‘secret.’ This isn’t the pure Edcamp model but the planning team wanted accountability and to keep the numbers low in the sessions. When a topic reached 10-12 participants, it was closed. Christina assigned topics/facilitators to rooms in the HS for each 45-minute session on a master schedule. Facilitators were asked to capture the conversation in some way (with a suggestion). I made a copy of the suggested spreadsheet and then shared it so that anyone with the link could edit. I took notes during our discussion and then emailed it to the participants so that they could add anything they wanted. I also added a link to the master schedule so that other staff members could keep the conversation going. After our mini-Edcamp, Christina sent out a feedback survey to get an idea of the overall reactions to Edcamp and also to the individual sessions. 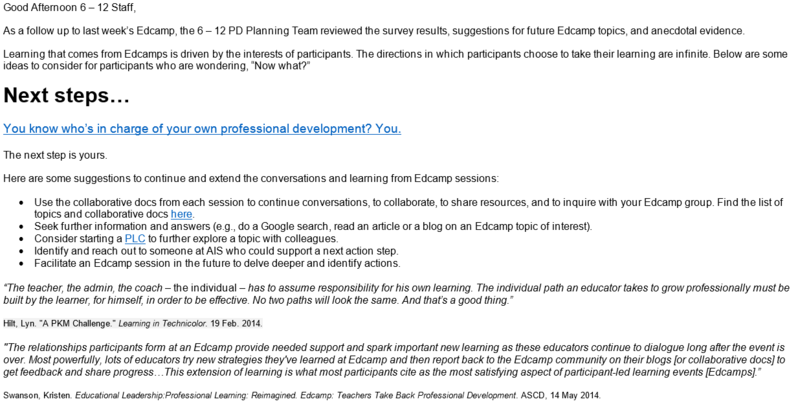 We’d love to hear about other grass-roots Edcamp movements! We’re hoping this can become something bigger and we can host an Edcamp for all of Kuwait in April. This is a fantastic resource. Thanks so much for sharing. Welcome! Definitely check out Christina’s post too!